Swedese is unveiling a new collaboration with international designer Khodi Feiz, as well as expanding last year’s successful product families Mino, Button and Pond. The Libri bookshelf system is celebrating its 10th anniversary with new tables and a new version of the Bespoke conference table is being launched. Swedese has enjoyed an extremely productive and intensive year since the furniture company presented eight future classics at last year’s Stockholm Furniture Fair. In a busy 2017, Swedese opened a new showroom on Malmtorgsgatan in central Stockholm, began an innovative collaboration with students at the furniture design school Malmstens Linköping University, held a creative workshop with designers at its Vaggeryd factory in southern Sweden, relaunched classic designs from the Swedese Archive and continued to develop the company’s vision and creative journey. And that’s not the whole story. Because now Swedese is once again doing what the company has excelled at for almost three-quarters of a century: developing and making new furniture in partnership with internationally acclaimed and successful designers. In his first collaboration with Swedese, international designer Khodi Feiz has created a comfortable easy chair with generous proportions and a timeless feel. As the name suggests, Pillo gives you a spontaneous sense of sinking down into a pile of soft cushions. Everything you need from an easy chair is stacked up in an ingenious design: a neckrest on a backrest on a comfortable seat on a reclining swivel base. The rounded form pays homage to the art of the upholsterer and the reference to Yngve Ekström’s classic Rondino easy chair is hard to miss. The Pillo easy chair is available in two back heights and with a footstool. RRP: easy chair low SEK 17,705, easy chair high SEK 18,895, footstool SEK 6,280. Inspired by the iconic Lamino chair, Mino is designed with the shape and needs of the human body in mind. This is a chair that has been meticulously designed for the comfort of the user. For 2018 the stylish Mino series is gaining an easy chair with footstool, an extra wide armchair and a wheeled armchair. As with the original chair, they are easy to get in and out of, simple to clean and proof that a truly comfortable chair can also look fantastic. Designer Thomas Sandell has managed to achieve an even better ergonomic standard with the new Mino XL armchair, which is 8 cm wider than the original. The new wheeled version is easier to move around. And despite its slim profile, the easy chair with footrest is as robust as it is comfortable. 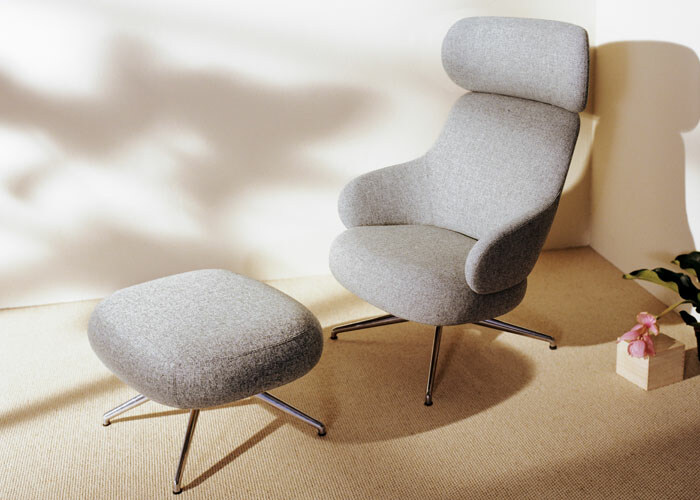 RRP: wheeled armchair from SEK 7,175, armchair XL from SEK 7,300, easy chair from SEK 9,750, footstool from SEK 4,500. The new Button easy chair shares the same task as its predecessor, the Button sofa, to fit just as comfortably into a retirement home as it does into a design-conscious young person’s first apartment. Design duo Front have taken a playful approach in creating a furniture series that literally grows into its task. Large wooden buttons that contrast with the upholstery allow you to attach cushions, sheepskin or other accessories to the sofa. A side table can be added to the new, smaller easy chair. Button is a modern interpretation of the superb craftsmanship that Swedese has built up over the years, as expressed in the use of the classic bentwood, with the easy chair’s legs gently transitioning into a solid handle. Beautiful and at the same time practical for sitting down and standing up more easily. RRP: easy chair SEK 16,500, side table SEK 3,100. Monica Förster’s popular Pond table now comes with three new ash tops, lacquered in shades that match the previous stone tables in the product family. Organically flowing wooden table tops rest on graceful steel frames in the same colour. The natural colour palette of sand, red-brown and dark grey conveys a harmonious feel that is accentuated by the elegant mix of materials. The different surfaces of the Pond tables can be combined with different leg heights and work perfectly on their own or as a group. RRP: table SEK 7,375. The acclaimed Libri system was created by Belgian designer Michaël Bihain in 2008. Libri can be used as a single shelf that leans against the wall like a ladder, but it can also be combined with other shelves to form a shelving unit along a wall or create a room divider. The legs can be adjusted individually to ensure stability even on uneven surfaces. Now a desk and a bar table are being added to the unique shelving system. Perfect for offices and apartments that are short on space. The new tables are available in white or black lacquered ash. RRP: bar table SEK 4,995, desk SEK 7,950. Bespoke, a simple and stylish table with a minimalist design, has been part of Swedese’s range since 2010 and is loved by many, both in a domestic environment and as a conference table. Now this popular table comes with new angled legs that allow for more seats around the table and provide even greater flexibility. The table top (90 x 200) is available in a range of wood finishes and there is a choice of metal or wooden legs. The Bespoke table can also be ordered in other sizes on a custom basis. RRP: table with wooden legs SEK 20,940. Khodi Feiz was born in Iran, grew up in the USA and in 1990 he moved to his current homeland of the Netherlands. In 1998 he founded Feiz Design Studio together with graphic designer Anneko Feiz-van Dorssen in Amsterdam. The studio specialises in product and furniture design plus strategic design for clients such as Artifort, Cappelini, Nokia and Samsung. Clarity, concept and context characterise Khodi Feiz’s design work, which has earned him various recognition and awards. His work has been displayed in many exhibitions all over the world.